Kansas Speedway – Page 25 – Welcome to Wyandotte Daily! Kansas City Chiefs linebacker Derrick Johnson will lead the Monster Energy NASCAR Cup Series field to the green flag as the honorary pace car driver for the Go Bowling 400 on May 13. Johnson is a 12-year veteran for the Chiefs, and is franchise’s all-time leading tackler (1,080 to date). He’s a team captain, four-time Pro Bowl selection, Pro Bowl MVP, and an All-Pro Selection, who has led the Chiefs defense since he was selected in the first-round out of the University of Texas in 2005. 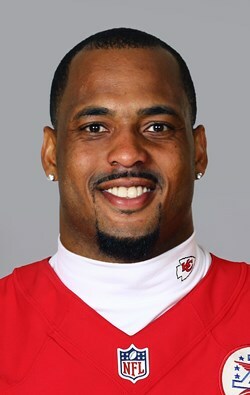 Even more impressive than his on-field accomplishments, is Johnson’s dedication to the community through the Derrick Johnson Defend the Dream Foundation, which works to provide low-income and inner city young people throughout the Kansas City area with opportunities and resources to reach their full potential. Additional information on the foundation can be found at www.derrickjohnson56.org. Go Bowling returns as the sponsor of the Go Bowling 400 for the second year. GoBowling.com is the destination for bowling fans and enthusiasts seeking news and information about one of America’s favorite pastimes. With more than 67 million people taking to the lanes every year, bowling is the nation’s number one participatory sport. Racing returns to Kansas Speedway on Friday, May 12, with the NASCAR Camping World Truck Series Toyota Tundra 250, and Saturday, May 13, with the Monster Energy NASCAR Cup Series Go Bowling 400 under the lights. In October, the Hollywood Casino 400 is an elimination race in the Monster Energy Series playoffs on Sunday, Oct. 22. The NASCAR XFINITY Series Kansas Lottery 300 will again be a part of the playoffs for the NASCAR XFINITY Series on Saturday, Oct. 21, while the ARCA Racing Series presented by Menards will wrap up their season on Friday, Oct. 20. Tickets are currently on sale by calling 866-460-RACE (7223) or online at www.kansasspeedway.com. General parking is free at Kansas Speedway and fans can bring in one 14x14x14-inch soft-sided cooler with their favorite food and beverages. Fans also have the opportunity to purchase a parking pass to park closer to the Speedway, and also VIP Tailgating options are available. Call 913-328-3391 for additional information. Fans can follow Kansas Speedway on Facebook atwww.facebook.com/kansasspeedway or follow on Twitter (@kansasspeedway). The most famous words in racing may get a twist when Larry the Cable Guy gives the order, “Drivers, Start Your Engines,” to begin the Go Bowling 400 on May 13 at the Kansas Speedway in Kansas City, Kansas. Larry returns to the big screen as the voice of Mater in Disney•Pixar’s “Cars 3,” scheduled for release on June 16. He first lent his voice to the iconic character in the Golden-Globe®-winning feature film “Cars” (2006) and returned to the role for “Cars 2” (2011). Both movies opened No. 1 at the box office and combined have grossed more than $1 billion worldwide. Larry is a multiplatinum recording artist, Grammy nominee, Billboard award winner and one of the top comedians in the country. In addition to his own merchandise line and selling out theatres and arenas across the country, Larry, along with his wife Cara, created the Git-R-Done Foundation, which was named after his signature catchphrase, and has donated more than $7 million to various charities with an emphasis on children’s and veteran’s causes. For information, visitwww.gitrdonefoundation.org. Larry, whose name is Daniel Lawrence Whitney, and Jeff Foxworthy are on a national tour, the “We’ve Been Thinking Tour.” The tour features all new material from both comedians and is available as a comedy special on Netflix. Larry, also, launched his own comedy channel “Jeff and Larry’s Comedy Roundup,” on SiriusXM. The channel is in partnership with SiriusXM and Jeff Foxworthy. It showcases the best in great American comedy, including this dynamic duo as well as their personal favorite comedians. He is also a bestselling author and his book “Git-R-Done” (2005) debuted at No. 26 on the New York Times bestseller list. He was also named to Forbes Celebrity 100 list, which lists the hottest and most successful people in the entertainment industry, in 2006, 2007, 2011 and 2012. Racing returns to Kansas Speedway on Friday, May 12 with the NASCAR Camping World Truck Series Toyota Tundra 250, and Saturday, May 13 with the Monster Energy NASCAR Cup Series Go Bowling 400 under the lights! In October, the Hollywood Casino 400 is an elimination race in the Monster Energy Series playoffs on Sunday, Oct. 22. The NASCAR XFINITY Series Kansas Lottery 300 will again be a part of the playoffs for the NASCAR XFINITY Series on Saturday, Oct. 21, while the ARCA Racing Series presented by Menards will wrap up their season on Friday, Oct. 20. Tickets are currently on sale by calling 866-460-RACE (7223) or online at www.kansasspeedway.com. General parking is free at Kansas Speedway and fans can bring in one 14x14x14-inch soft-sided cooler with their favorite food and beverages. Fans also have the opportunity to purchase a parking pass to park closer to the Speedway, and also VIP Tailgating options are available. Call 913.328.3391 for additional information. “Musta Had A Good Time” could be the anthem song for NASCAR fans, and on May 13 fans attending the Go Bowling 400 will be able to hear country rock band Parmalee play the song live prior to the race at Kansas Speedway. Parmalee’s debut album, “Feels Like Carolina,” has earned critical praise from People, The New York Times, USA Today, Newsday, Billboard and more. Country fans voted the band’s debut single, “Musta Had A Good Time,” No. 1 for four consecutive weeks on SiriusXM’s The Highway “Hot 30 Live” countdown and the song became a Top 40 hit on mainstream country radio. The fun-loving party anthem has been featured in national sporting event broadcasts from the PGA to MLB. The band made history when its multi-week No. 1 smash “Carolina” became the longest climbing single by a duo or group in the 24-year history of the Billboard Country Airplay Chart. They were also the first multi-member country act to garner a #1 single on both the Billboard Country Airplay and Mediabase-Country Aircheck charts since Florida Georgia Line. “Carolina” was certified gold (for over 500,000 in sales) by the RIAA. To see Parmalee from the Kansas Speedway tri-oval, add a pre-race pass to your race day ticket. Tickets to all Kansas Speedway events are currently on sale by calling 866-460-7223 or online at www.kansasspeedway.com. Racing returns on Friday, May 12, with the NASCAR Camping World Truck Series Toyota Tundra 250, and Saturday, May 13, with the Monster Energy NASCAR Cup Series Go Bowling 400 under the lights. In October, the Hollywood Casino 400 is an elimination race in the playoffs on Sunday, Oct. 22. The NASCAR XFINITY Series Kansas Lottery 300 will again be a part of the playoffs for the NASCAR XFINITY Series on Saturday, Oct. 21, while the ARCA Racing Series presented by Menards will wrap up their season on Friday, Oct. 20. Parking is free at Kansas Speedway and fans may bring in one 14x14x14-inch soft-sided cooler with food and beverages.